It’s crazy how insane the past couple weeks have been. The movers handled the large items and friends carried loads of boxes, but our new townhome sat piled ceiling-high with boxes for a week as we spent time outside with the neighbors and packed up for a beach vacation. Sand is always good. Sand that has been dredged from the bottom of the ocean is near perfection. There’s not a sharp sea shell in it. You can dig and dig and dig out a hole large enough for boys to jump in and be completely hidden from sight. You can drizzle it into the forest where the trolls live while waiting to save Princess Ana from the accidental strokes of Elsa. You can mold a horse to be galloped upon. You can mold sandballs of wet sand dabbed in hot fine sand to threaten siblings with. You can rest. There are few things more relaxing than sun and sand and the lap of waves. There are also few things more terrifying than the power and pull of water. The warm sun was coaxing my eyes to close as I sat upon a boogie board and watched the three boys jump in the surf. After each wave, I would identify them – The First One shakes his head to get the water out of his ears. Super Tall Guy wipes the water from the top of his head to his chin. Mr. Ornery bounces and bounces and bounces. He comes up from under a wave and bounces as he awaits the next. His ringlets bounce. His body bounces. His arms bounce. And suddenly there was no bounce. I looked again. There was his head very close to Super Tall Guy, but there was no bounce. They were too far out. They were too far out to see their faces, but I was on my feet and headed out there. A glance at the lifeguards on their stand showed that they were not going to be of any help. The panic started to rise as each wave pushed me back from my singular goal – to reach my boys who were being swept out to sea. But I wasn’t getting there fast enough. Do I scream? Yell? The three adults near them were close enough though. One man reached for Mr. Ornery and pushed into shore. One man grabbed Super Tall Guy and guided him in. I watched The First One start to swim. Mr. Ornery wrapped his arms and legs around me as he clung sobbing in my arms. I tearfully thanked the Helpers. I praised Super Tall Guy for clear attempts to save his younger brother and keep him afloat. Suddenly I panicked again looking for The First One. Where was he? Mom, where is he? Super Tall Guy, where is he? I rushed to the lifeguards and then turned and found him. He had swum beside the current and then into shore. We all hugged. 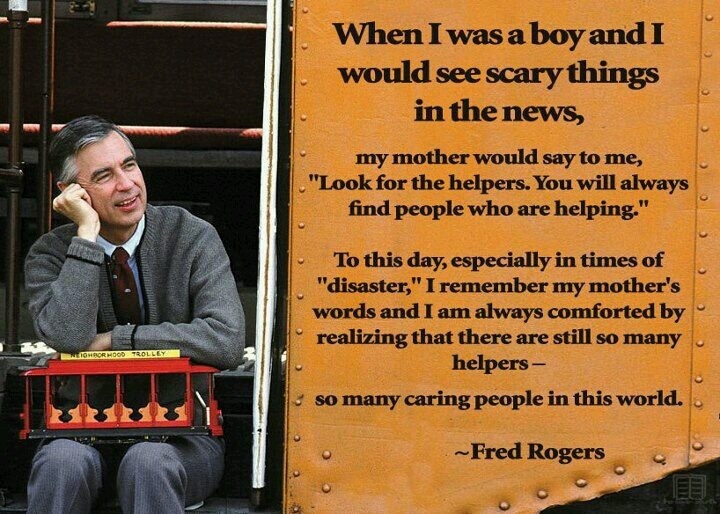 “Look for the helpers,” I reminded the boys as Mr. Fred Rogers so eloquently stated. When you are in trouble, look for the helpers. They will be there. Ask Mr. Ornery how his vacation was and he’ll say “I was almost dead.” We had to talk a lot about it that night. We talked about safety. We talked about the power of water. We talked about the helpers. We talked over and over about how you “NEVER go out past your waist” and you “NEVER swim alone.” We talked about going back in again. And yet he did. Bouncing along right into the deep. This boy is going to require a whole lot of “teachable moments.” And he’s going to need a whole lot of Helpers! But I, for one, would like to skip the “near death” moments the next time he needs to learn a lesson.